Go ahead, take a look. Let it sink in…..waaaait for it…… there. I told you. Still wondering what it is you’re looking at? That’s ok, you’ll love it even after I tell you. This raw image from Cassini was acquired on September 4, and was taken with the spacecraft’s clear channel filter (meaning it’s picking up visible light, although monochrome.) What we see here (and why it’s so cool) is the rings seen nearly edge-on crossing through just down from center of the frame, lower left to upper right, and then the shadows of said rings appearing as dark bands below with just a touch of arc to them. 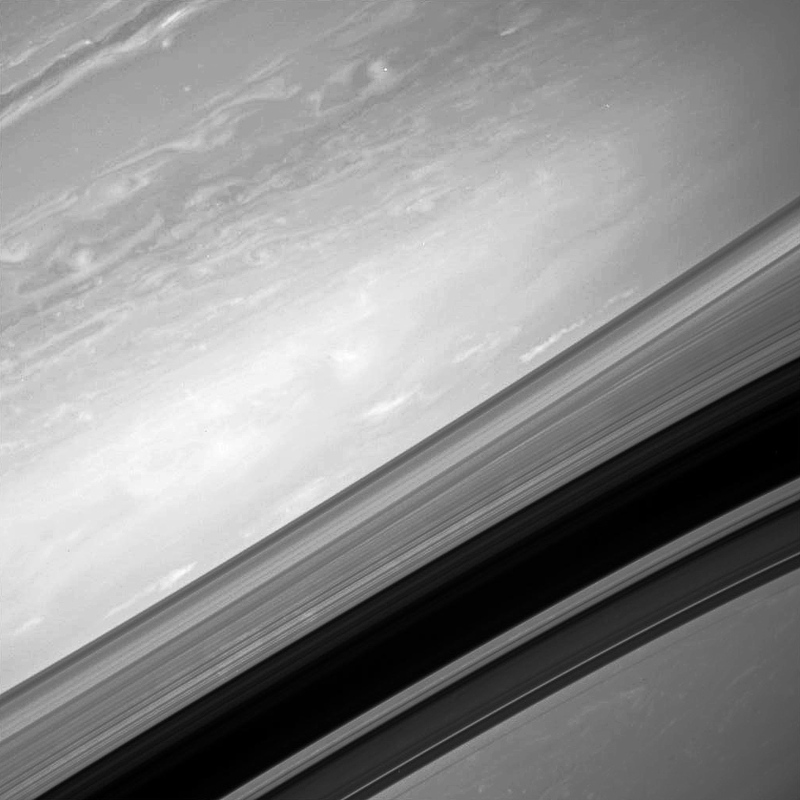 Behind all that are the cloudtops of Saturn itself, swirling bands and blotches of storms and eddies. Now isn’t that cool? I thought so. See the original raw image here (I rotated it 90 degrees and boosted the levels to bring out detail.) It was taken from a distance of 1,282,976 miles (2,064,749 kilometers) away. *Yes, you may have guessed it was a picture of Saturn but you might have missed the band of the rings seen edge-on…which in my opinion lends a whole new level of depth to it. Again, once you see it. Spectacular!! It seems Nature is the best painter in the world, and Cassini the best photographer!